Shimano Dura-Ace bicycle parts have some compatibility issues when used with other parts. There is a lot of confusion and misinformation about this. This article explains the differences, and how to work around compatibility problems. The Dura-Ace name goes back to at least 1973 You can see the 1973 Dura-Ace Catalogue here. You can also see the 1982 Shimano Dealer Catalogue here. Dura-Ace was always Shimano's attempt to make a top-of-the-line parts group, but it was not really successful until 1984. In 1984, Shimano introduced Dura-Ace S.I.S. (Shimano Indexing System) the first successful indexed-shifting system. It was a 6-speed system with indexed shifters mounted on the down tube. As with any new product, once it was in regular use, minor problems came to light, and they were rectified in later versions. One of the risks of buying into a brand new system is that you are, to some extent, a guinea pig. All of the compatibility problems associated with older Dura-Ace parts result from genuine improvements that Shimano made after the original introduction. Since the original Dura-Ace was represented as the top-of-the-line possible with 1984 technology, Shimano had a bit of a problem explaining changes in compatibility. Shimano didn't want to obsolete earlier Dura-Ace versions and leave its customers stuck with orphaned equipment, but also wanted to keep improving products. The marketing department tried to pass off the differences as signs of Dura-Ace's higher quality vis-a-vis the lower priced systems. Dura-Ace went through multiple generations, from 6-speed, through 7-speed and 8-speed through the 1996 model year. 1997 was a very big year for Dura-Ace. The system went to 9 speeds, and that was the most publicized change. In addition, however, the entire Dura-Ace system was redesigned and made to be inter-compatible with other Shimano components. The major difference between pre-1997 Dura-Ace and the rest of the Shimano lines is the cable travel of the rear derailer. Old Dura-Ace used a shorter amount of cable travel per shift. This has to do with the geometry of the cable attachment. Since the cable moved a shorter distance per shift, effects of cable friction or inaccurate cable adjustment were magnified. With the introduction of the 6-speed 600EX S.I.S. group, the cable attachment on the rear derailer changed, so that the cable had to move farther per shift. This change reduced cable tension, reduced the effects of cable misadjustment and friction, and generally made for a more forgiving system. The same geometry was adapted for 9-speed Dura-Ace when it was introduced in 1997. All subsequent S.I.S. groups match the travel of the 600EX, except the 10-speed "Shadow" XTR derailers and shifters, which have an even longer cable travel.. The yellow areas in the table below show where the the most common Shimano rear derailers won't work, or need a modified cable routing to work. This alternate cable routing will also let you use a 10-speed shifter with a 9-speed cassette. This provides a convenient upgrade path. Through 1989, Shimano cassette sprockets used a "twist-tooth" design, called "Uniglide." They had 9 identical splines (tabs) that would slide into matching grooves on the Freehub body. Spacer washers would fit between each pair of sprockets. 5- and 6-speeds used 3.65 mm spacers, 7-speed generally 3.1 mm, 8-speed 3.0 mm. 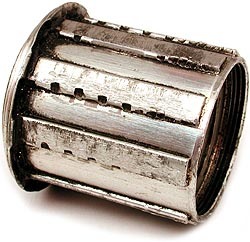 The smallest sprocket on a Uniglide cassette was not splined, it was threaded. The threads of this sprocket would hold everything else together. The only functional difference between Dura-Ace and other Shimano cassettes is that the threaded Uniglide outer sprocket had a different thread in the Dura-Ace version. This was to permit the use of an 11 tooth sprocket with Uniglide Dura-Ace. 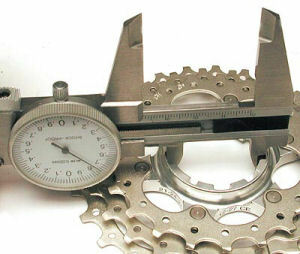 Other Uniglide hubs/cassettes were limited to a 12 tooth minimum sprocket by the larger thread. All Dura-Ace 6- & 7-speed cassettes were Uniglide style. 8-speed Uniglide cassettes and hubs were made only for the 1989 model year, so they are quite uncommon. In the 1990, Shimano introduced "Hyperglide" a new sprocket design that allows the chain to engage two adjacent sprockets simultaneously. It meshes with the new sprocket before it disengages from the old one. This results in smoother, quieter, faster shifting. 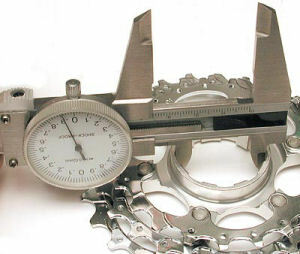 This is accomplished by shaping individual teeth differently on the same sprocket, and by forming ramps into the sides of the sprockets to facilitate downshifting. Since the rotational position of the sprocket is critical to making Hyperglide work, threaded sprockets cannot be used. All sprockets in a Hyperglide cassette are splined, and a special lockring screws into internal threads on the Freehub body to hold the set together. Cheapest: Uniglide sprockets are basically symmetrical, so if you have a worn-out cassette, you can flip the individual sprockets over. This will let you use the un-worn sides of the teeth. This doesn't work for the smallest (threaded) sprocket, but does work for all of the others. Moderate: Hyperglide sprockets have one wider spline where they fit onto the Freehub body, as you can see above. If you grind this wide spline off, you can use any current Hyperglide sprockets or complete cassette, except, again for the smallest sprocket, which must be the special Dura-Ace threaded type. Best:You can replace the Freehub body with an 8-9-10 speed Hyperglide unit as described below. The Freehub body is the part the sprocket cassette mounts to. The Freehub body contains the ratchet mechanism that allows you to coast. For most purposes, the Freehub body is considered part of the hub itself, but, in fact, it is possible to remove it. 1996 and earlier (6-, 7- & 8-speed) Dura-Ace Freehubs require a threaded body: the aluminum hub shell has matching threads. This system is not interchangeable with anything else, but these Freehubs are all interchangeable with one another, so you can upgrade from 6 or 7 speeds to 8 by installing an 8-speed body. This is a rather expensive part, but if your wheel is in good shape, this can be worthwhile. With the new body, you'll be able to use any 8-, 9- or 10-speed cassette that doesn't include an 11 tooth sprocket. You'll need the special tool for this, TL-FH10. As of 2010, both the body and the tool may be hard to find. 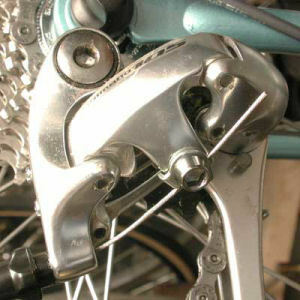 1997 and later (9-speed) Dura-Ace Freehubs have a spline attachment between the Freehub body and the aluminum hub shell. These use a hollow 10 mm Allen bolt to hold the Freehub body to the shell. This same system is used for most non-Dura-Ace Freehubs. Exceptions: "Silent Clutch" models. In 2004, the crank and bottom bracket changed. The new crankset uses the "Hollowtech II" design pioneered with the previous year's XTR group (also shared with 2004 XT and Saint). This system has the bottom bracket spindle permanently attached to the right crank, and uses "outboard" bearings that actually are located outside of the bottom bracket shell. This bearing placement permits the use of larger-diameter bearings, and thus a larger diameter, hollow spindle. It effects a considerable weight reduction with a claimed increase in stiffness. This system has since "trickled down" to several lower-level Shimano groups. The bottom-bracket parts of these are all interchangeable. This design has also been copied by other manufacturers, including Truvativ, again using compatible bottom bracket bearing assemblies. 2004 Dura-Ace (10-speed) 7800-series Freehubs were completely redesigned too. The Freehub body was attached to the axle, rather than to the shell, to save weight and to have the pawls act at a larger radius. Also in an effort to save weight, the 2004 Dura-Ace Freehub body is aluminum. Other manufacturers have used aluminum Freehub bodies, and it has been a problem because the steel sprockets can cut notches into the splines of such a soft material. You see an example of this in the photo of an off-brand aluminum body here. To avoid this problem, Shimano has made the first change in its spline pattern since the introduction of Hyperglide in the late '80s. Dura-Ace 7800 10-speed freehubs have taller splines than other Shimano models. As a result, it is not possible to install cassettes other than 10-speed models on Dura-Ace 7800 hubs. It is not, however necessary to use Dura-Ace 10 speed cassettes. The Ultegra 10 speed cassettes also accommodate the taller splines of the 7800 hubs. The interchangeability issue only applies to that particular hub design. The 10-speed cassettes will fit on any Shimano 8- or 9-speed Freehub with no problems. The Ultegra 10-speed group introduced for the 2005 model year has no such limit for the standard hubs, but there is one Ultegra complete wheelset that shares this limitation. Shown below are parts of two Ultegra 12-27 cassettes. The 10-speed version on the left is over 37 mm in maximum inside diameter, while the 9-speed version is only about 35 mm in maximum inside diameter. For the 2008 Model year, Shimano introduced the Dura-Ace 7850 Freehubs . These have titanium Freehub bodies, and have reverted to the standard cassette spline pattern used on other Shimano Freehubs, so they will accept any Hyperglide cassette, 7-,8, 9- or 10-speed. The Freehub body attaches to the hub shell with a splined fitting with a larger diameter and larger number of splines than on other Freehubs. The Dura-Ace 7900 Freehub is very much like the 7850, but most parts are not interchangeable. Myth: If you have a 6-speed cluster, you need a 6-speed derailer. Truth: No, the derailer itself doesn't care how many speeds there are. That's determined by the cluster and the shifter. Dura-Ace 6-, 7- & 8-speed derailers are interchangeable with one another. Non-Dura-Ace 6-, 7-, 8- and 9-speed derailers are interchangeable with one another, and with Dura-Ace 9- and 10-speed derailers. Myth: Dura-Ace cassettes have a different spacing, and are incompatible with other derailers/shifters. Truth: No, all Shimano cassettes and freehubs with the same number of speeds use the same spacing, and index with any system configured for the same number of sprockets. Myth: If you have a Dura-Ace hub, you need to use a Dura-Ace cassette. Truth: The only truth in this is that for the old Uniglide systems, the smallest (threaded) sprocket used a smaller thread diameter in the Dura-Ace version, and that aluminum 2004-2007 Dura-Ace Freehub bodies with tall splines will only take the Dura-Ace and Ultregra 10-speed cassettes with the deeper notches. Newer "Superglide" chainrings from Shimano use similar features to the rear Hyperglide system to improve front shifting. The outer rings have special shaped teeth here and there, called "gates" which make it easier for the chain to climb up. There are also steel pins riveted into the sides of the larger rings to help the chain climb. When this system is working as it should, the chain makes a very smooth transition from small to large chainring with no slippage. For this system to work as smoothly as it is designed to, the locations of the teeth on the smaller ring should be specifically placed with regard to the positions of the teeth of the larger ring. This requires that the chainrings be used in matched sets. Shimano has two "road" sets, designated "A" and "B". Set "A" uses a 42 tooth small ring, and a corresponding "A" type 53. Only Shimano is this fussy about chainwheel matching, and this is by no means mandatory. In particular, if your bike currently has an "A" set 53/42 and you decide you'd rather have a 39, this doesn't mean you need to replace the 53 as well. It will still shift, and shift well, just, perhaps, not quite as well as the designated set. When the move from 8- to 9-speed took place, starting with 1997 Dura-Ace, a very slight change in chainring design occurred. Shimano was concerned about the potential for the chain to "skate" over the teeth of the small chainring. For the 2002 model year, Shimano introduced a triple chainring crank set in the Dura-Ace line, with corresponding STI shifters, front and rear derailers. While other Shimano "road" triples come with 52-42-30 chainrings, the Dura-Ace version comes with 52-39-30 rings. At first this seemed like a welcome upgrade, offering greater versatility to the road/touring cyclist. Unfortunately, the way Shimano chose to do this is rather wrong-headed and retrograde, resulting in a crankset that is even less versatile than the 130/74 "road" triples in the Ultegra, 105, Tiagra and Sora lines. Instead of using a crankset with two sets of mounting holes, as with other modern triple sets, the 30 tooth chainring attaches to the 39 tooth ring, rather than to the crank itself, in the manner of a Willow Triplizer or a TA conversion chainring. "Oh, great," you say, "so then you can retrofit the 39 onto other 130 BCD doubles!" Well, no. Unlike the Willow and TA conversion rings, the Dura-Ace is specifically designed NOT to fit a standard 130 double crank, because the "shelves" that support and center the middle ring get in the way. The "triple" Dura-Ace crank has had these "shelves" machined off flush, so it is the only crank that can accept this chainring, even though it does still use the standard 130 mm bolt circle. But wait! It gets worse! Instead of using the standard 74 mm bolt circle for the 30 tooth chainring, as on all of other Shimano "road" triples, Shimano has seen fit to create a brand-new bolt circle pattern just for this application, 92 mm. Thus, there is NO other chainring besides the stock 30 that can be used with the Dura-Ace triple. I'm generally very supportive of Shimano, but I'm really dismayed by the very unfortunate direction taken with the Dura-Ace triple. What ever made Shimano think the world needs a new bolt circle diameter? Details not currently available, information welcome. 7700 9-speed. 7700 Splined crank/bottom bracket. Cartridge brake shoes. Major revision, eliminated compatibility issues with the rest of the Shimano line. 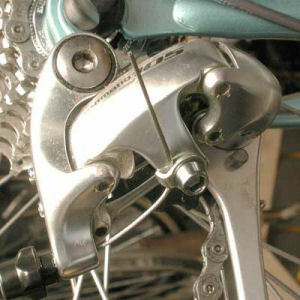 With the move to 9-speed, derailer cable pull was standardized throughout the Shimano line. Flight Deck cyclecomputer. 7700 SPD-R pedals. Triple chainwheel option. Uses proprietary 30 tooth chainring, not interchangeable with anything else. 7850 Freehub with titanium body, goes back to standard cassette dimensions; larger-diameter spline system between cassette body and hub shell, accepts all Hyperglide cassettes: 7-. 8-. 9- & 10-speed. 7900 Freehub uses as similar spline system as 7850 to attach to the hub shell, but most hub parts are different. Accepts all Hyperglide cassettes: 7-. 8-. 9- & 10-speed.